The Marché des Enfants Rouges may not offer an extensive choice of fresh fruit and vegetables, but I don't think that's the point. In reality, it is unlikely that anything you buy there ever even had a chance of making it past your mouth and into your shopping bag. The aisles of the intimate marketplace are packed with specialty vendors who provide their shoppers with various seating arrangements. This cosy and inviting arrangement results in the irresistable temptation to sit down and enjoy your recent purchase before it hits your panier. Cheese, wine, meat, fish and vegetable vendors mix nicely with a selection of “order at the bar” restaurants that represent a vast mélange of international cuisine; Japanese, Lebanese, Italian and Moroccan restaurants complement the French bakery that serves crêpes and sandwiches and the standard selection of baked goods. The line that grew steadily in size when we arrived at around 11h30 confirmed this boulangerie as a neighborhood favorite. 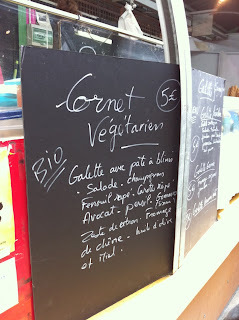 Vegetarians are taken care of chez les enfants rouges, with several vendors including veggie options as a part of their menu- this is welcome news as it can be a rarity in France, even at happy hippy farmers' markets. The market, which reopened in November of 2000, takes its name from the red-clad children, or enfants, who resided in the orphanage that occupied the space before the market was originally established in the year 1615. 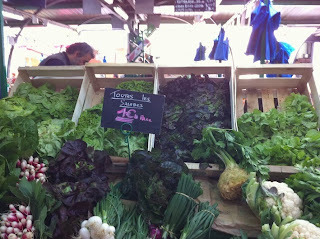 While the market's roots are undeniably French (King Henri IV wanted to call the square where the market resides Place de France and subsequently name all surrounding streets after French regions), an international influence on the market can be felt, and not just in regards to the sushi and semoule being served. Much of the produce, which was not always clearly marked regarding its origins, came from outside the hexagon. While Spanish-origin fruits and vegetables were less prominent than they seem to be in corporate markets, the presence of many non-local items - bell peppers imported from Italy, for example-was a bit of a disappointment. 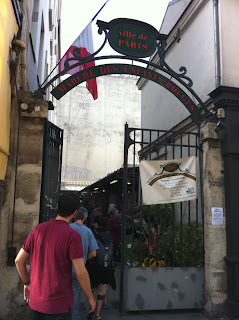 On our Sunday trip to the Marché des Enfants Rouges we wandered around snacking on our chickpea-based Southern specialty socca (2 euro a serving)and found some French nectarines (6.90 euro/kilo), along with a mixture of local salads (18.00 euro/kilo) and a beautiful eggplant (5.90 euro/ kilo)- a long cry from what I rescued a week ago from Carrefour- to take home with us for dinner tonight. While not uniformly local, or even organic, the market's vendors are friendly, knowledgeable and seem to be genuinely invested in preparing and selling good food, which makes the Marché des Enfants Rouges an undeniably pleasurable and mouth-watering weekend outing.